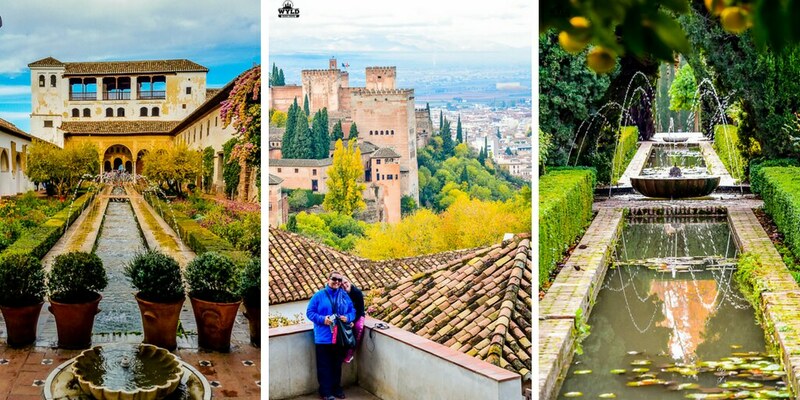 Before visiting the Alhambra in Granada, Spain I did not know too much about it. I was aware that it was a must-see destination in Granada and I roughly knew that it was a Moorish Castle. That had some sort of ties to the famous English Queen Katherine of Aragon. 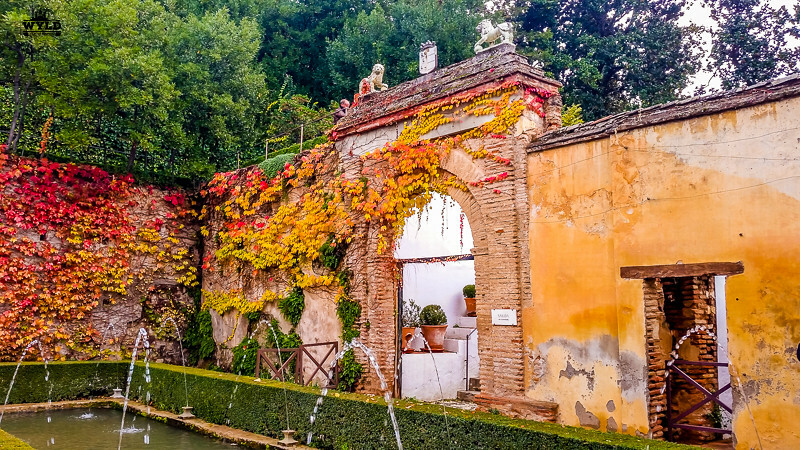 What I did not know was the Generalife Gardens of the Alhambra were amazing in their own right and that I would be completely blown away by its beauty. What you see today though at the Generalife Gardens may be nothing that was seen during the 13th Century when they were created. It’s not known how original the gardens are, there where no plans or drawing left. What is known is that after the Moorish Kings were displaced there were many alterations done by the Christians. No one quite knows for sure what the title Generalife means. Many have loosely translated Generalife to mean the Governor’s Garden or the Architect’s (Alarife) Garden. 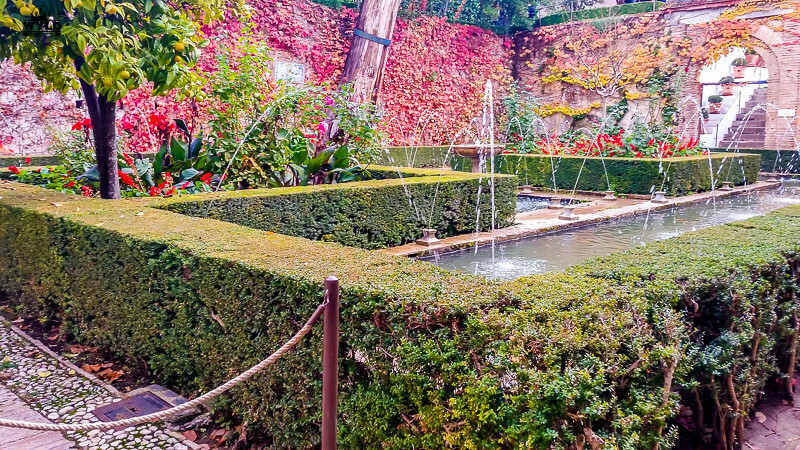 Unfortunately, people miss the Generalife Gardens as they are more interested in just visiting the Alhambra and in our opinion, this would be a huge mistake. Generally, it’s considered that the Generalife Gardens were built in the 13th century. This is known because there is an inscription that dates from 1319. 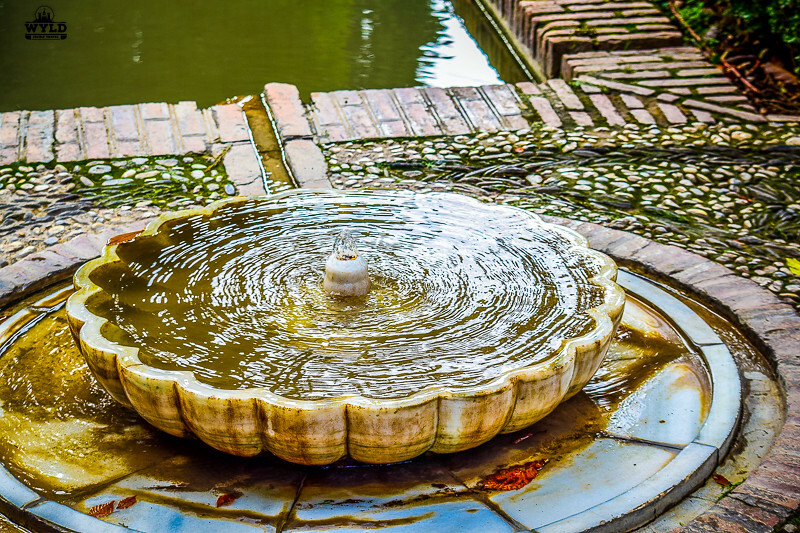 The Generalife was used by the Kings as a place to relax and get away from the city. The Generalife Gardens and the Alhambra are very close together but in its day they were considered separate with the gardens located outside the city walls. The view as you walk into the Generalife Granada Gardens is eye-catching, to say the least. You are torn whether to look right or left. If you look right you see the amazing manicured gardens that seem to continue to rise on various levels. If you look to the left you look out over the Alhambra and the Granada Township, white houses with tiled roofs and onto the distant mountains. And then there is the beautiful citrus smell that follows you everywhere you go. It is not an overpowering smell but one that just seems to sit on the air. It just gave it another amazing aspect to how well the gardens were an important part of life outside of the city. With the roses spotted all over the gardens, they must have made it smell heavenly when they are all in bloom. 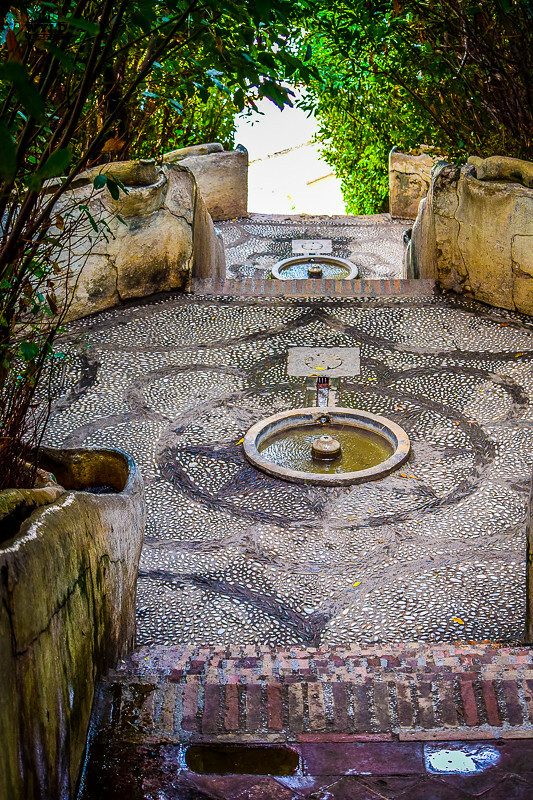 The Water Stairway at Generalife Granada Gardens was my Favourite! Some of our favourite parts were The Water Stairway. The Water Stairway is three levels of stairs with a pond in the middle of each section and water flowing down the side of the Stairways via channels. The Stairway is totally encased by overgrowing foliage. It was a beautiful part of the Gardens that leads to some of the highest points of the Generalife Gardens. The Court of the main Canel is a beautiful enclosed building with a canal the middle and fountain jets that cross each other. As beautiful as it may be it is now a long way for what it originally looked thanks to a fire in the early 19th century and alterations made by the Christian Monarchs. At the top of the Water Stairway, you will reach the highest point in the Generalife Gardens. Here you will find The Romantic Observation Point. A relatively new addition to the Generalife Granada Gardens built in 1836 and it is called The Tower. It generally differs from the rest of the architecture of the Generalife but the views from the top are stunning. We were alerted by her crying and luckily ‘Mamma’ is a worldwide known phrase. Before we knew it two beautiful ladies had returned her to us. Sometimes this is a good thing as she stayed close for the rest of the day. In general, there are stairs, fountains and hedges which make for a great adventure. Marley was very interested in the Kings and Queens who lived in The Alhambra and relaxed in the Generalife Gardens. She was full of questions, some being difficult to answer. Willow loves the audio guides and just takes in the history of such places like a sponge. Family Travel Tip: Book your tickets online well in advance as they sell out quickly. Tickets can be booked on Ticketmaster Spain and Get Your Guide. Don’t be fooled into thinking you have to do an expensive tour of the Generalife and Alhambra, you don’t. If you buy your tickets at Ticketmaster online they will cost you 16 Euro. Read more tips for buying Alhambra tickets. 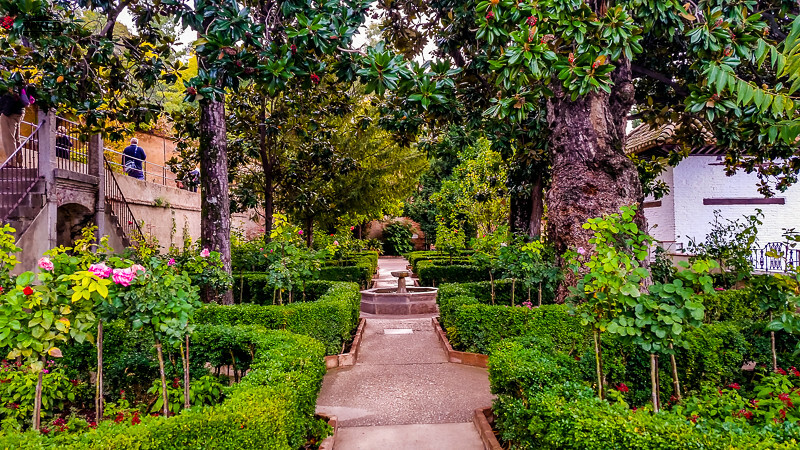 Book your entry to the Nasari Palace for around lunchtime that way you have a few hours prior to exploring the Generalife Gardens. Get a taxi to the Alhambra it’s just as cheap as the bus. You can then stroll down the hill back into town. Also, take some snacks for the kids. Waiting in line was where ours decided that they were really hungry. There is a cafeteria in the grounds of the Alhambra but it seemed very busy. The Gardens at the Genralife Granada ae not tto be missed. 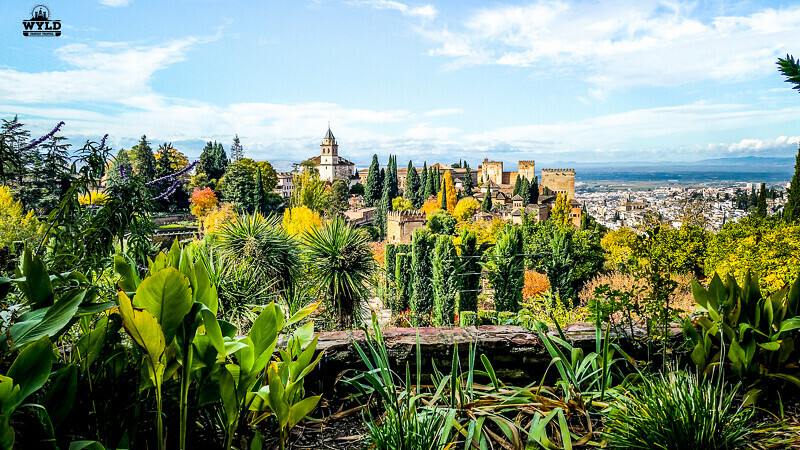 There are many things to do in Granada but make sure the Gradens are on your list. Its great choice for adults and kids in Granada. Along with the Alhambra the Generalife is the top Granada attraction to see on your visit. The Granada Old Town area is a nice place to stay its close to the Alhambra, Granada Cathedral and the Albaicin. What a gorgeous place. I’ve been once and was happy to go back there virtually with you. Looks like you had a beautiful day! These gardens look amazing. I had Alhambra in mind but I didn’t know this place existed. Seems so peaceful. Great photos. I’ve never heard of this place either, but I can see why it’s so popular. The photos of the gardens are amazing, so I can only imagine how awesome it is in person. Those Kings were so lucky to have a beautiful garden like this! Wow, I haven’t gotten a chance to visit an amazing garden like this. I simply can’t wait to see it myself soon. This will surely be penned on my bucket list. Thanks for the virtual tour! 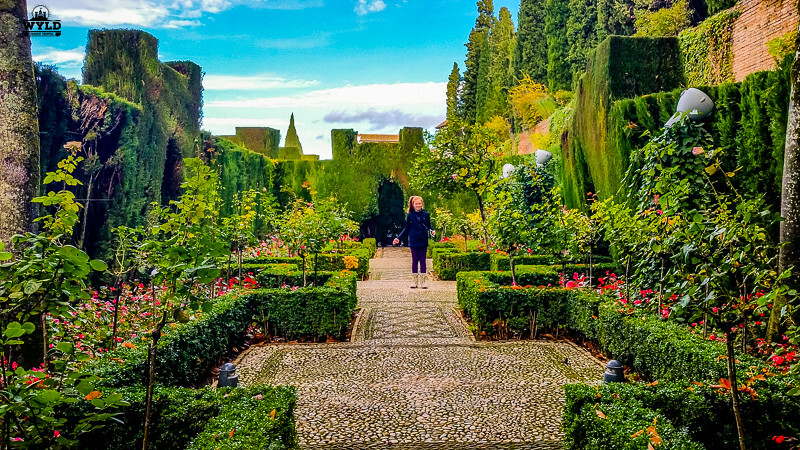 Definitely looks like Generalife gardens are an amazing attraction in their own right and I can see why you were completely blown away by its beauty. Hey, if it’s good enough for Kings right!! Beautiful beautiful beautiful. One of my favourite things to do in the UK is visit gardens. Funnily enough I forget when I’m abroad. You have convinced me to visit more gardens in other countries. And particularly this one in Andalusia. Great pictures BTW! Love it. We’ve been in Spain for nearly a year and a half and still haven’t got to Alhambra yet. That’s one fo the great things about living in Spain. There’s so much to see! Wish we could have met up in Valencia or elsewhere. Next time, Mark. Going to be there in a few months.. yay! It looks incredible, cannot wait. Great trip for you guys, I’ve loved following along!